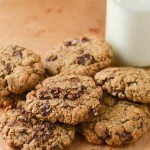 Our lactation cookies recipe is not only easy to make they're also the best lactation cookies recipe we've ever tried. Filled with healthy ingredients like brewers yeast, oatmeal, quinoa, flaxseed, and pumpkin seeds, some of the best foods for breastfeeding! Using a stand mixer combine the butter, sugars and vanilla. In a separate bowl combine all of the dry ingredients, the whole wheat pastry flour, baking soda, brewers yeast, flaxseed, and salt. Add the dry ingredients to the wet ingredients and also add in the egg. Fold in the oats quinoa, seeds, and chocolate chips and mix just until the dough forms. Bake in the oven for 12-14 minutes. Allow cookies to cool on a wire cooling rack. We recommend rolling the cookies into balls then flattening into a cookie shape, not pancake flat. If you notice the cookies aren't getting flat enough take a metal spatula and press them down about 10-12 minutes in.